What is sending eMails one by one? However, obviously - this is not the most suitable answer. Especially, today’s computer technology is so advanced. Nowadays, sending emails one by one should mean: write an email, input receiver A, B, C…, click “Send”, the email will send to receiver A, B, C…individually. In fact, this action will send out 3 emails, one to A, one to B, another to C. And in the received emails, A will only see himself/herself on the [To] field (in fact, this email has only ONE receiver – A), also for receiver B and C.
Why need to send eMails one by one? Here are some sample purposes to answer this question, but the actual purposes are not only these, you may find out more in your work, life and learning. Improve delivery success rate. Because it is a normal P2P email – AAA send to BBB directly. Reduce the manual operations, just click “Send” one time, it will send many emails for each receiver individually, automatically! Respect for each receiver – the received email looks like only for ONE recipient. Protect the privacy of your receivers. No anyone can see others in the received email. Sure, you may say point 4 can be achieved by BCC feature – just a common email field, but consider the success rate, personalized messages (with another feature – macro, you can make the personalized emails easily), one by one mode is better than BCC, a lot. Also, you may need one be one email feature for some other reasons. 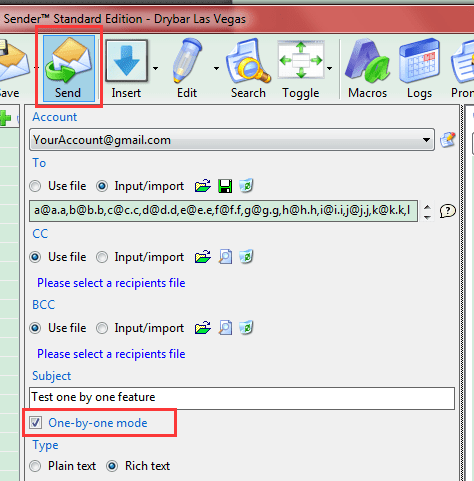 How to send eMails one by one by Auto Mail Sender™ Standard Edition? Our software - Auto Mail Sender™ Standard Edition (AMSSE) supports one by one emailing directly, just write your email and keep the “One-by-one mode” is checked, and then click <Send> button. Download AMSSE to send automatic email (send an email in the future) in one by one mode! Screenshot: send email automatically (send an email in the future) with one by one mode. Also, AMSSE supports to send an email in the future, so, you can even send emails one by one without click the <Send> button, just save your email and then schedule it. You can also read the Schedule eMails feature to learn more about how to send email automatically. Download AMSSE to send automatic email in one by one mode!